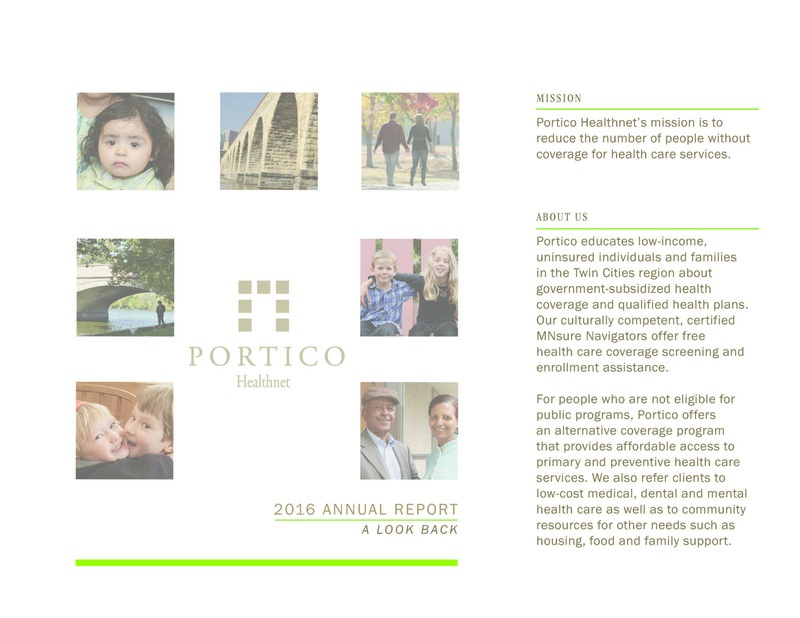 Portico Healthnet's mission is to reduce the number of people without coverage for healthcare services. We support the health and wellbeing of 17,000 low-income Minnesotans each year, helping them to obtain health care coverage so they can seek the medical care they need when they need it, increase health literacy and self-efficacy skills, and avoid major medical costs. Our clients are highly diverse, uninsured, low-income children, families and adults, many of who are immigrants or refugees and do not speak English as their primary language. We help clients enroll in affordable health coverage and attain not only medical care but also needed mental health and dental care, as well as other family support services that are important components of overall health and wellbeing. Our goals are to: • Educate low-income, uninsured individuals and families in the Twin Cities about affordable government-subsidized health coverage and qualified health plans and help them enroll when eligible; • Provide affordable access to primary/preventive health services through Portico's alternative Coverage and Care Management Program for people who have no other option for coverage; • Advocate for individuals and families so they receive the services for which they are eligible; • Educate people on how to use the health care system most effectively; and • Promote preventive health care practices within the community. Have experience with Portico Healthnet ?